COLONEL JOHN WHITEHEAD PEARD Unsigned Photograph. British (English) soldier, known as 'Garibaldi's Englishman'. A fine unsigned albumen carte de visite photograph of Colonel Peard by Grillet Jno. of 28 Sta. Lucia, Naples. Circa 1861. 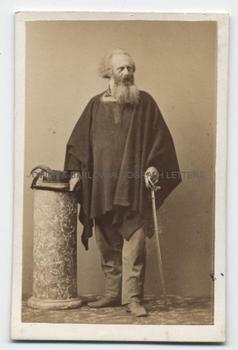 Peard is shown full-length in a woollen poncho of the same style as worn by Garibaldi, with his hand resting on a walking stick and a feathered hat placed on an Italianate marble column. The carte de visite measures approx 4 x 2.5 inches including photographer's original mount. 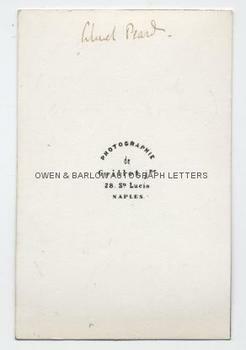 The photographer's printed details are on the verso. In exceptionally fine, unfaded, bright condition. Colonel John Whitehead Peard was an Oxford educated lawyer and the son of the British Admiral Shuldum Peard. Shocked by the brutality of Italian officials that he had witnessed whilst in Naples, Peard joined Garibald in 1860. He was given command of a unit and for his bravery and marksmanship during the fighting he was awarded the Cross of the Order of Valour by King Victor Emmanuel II. After the war he returned to Fowey, Cornwall and lived the life of a quiet Victorian gentleman. His Cornish house, Trenython, was built in the Italian style and its building was funded by Garibaldi. For his role in the fighting for the unification of Italy, Peard is known as 'Garibaldi's Englishman'. This image is identical to the one held by the National Portrait Gallery that was formerly in the collection of the Earl of Harrowby. The National Portrait Gallery ascribes the photograph to the English photographer, Henry Hering. However, this appears to be an error, as this carte is clearly marked on the verso with the name and studio of address of the Naples photographer, Grillet and must have been taken in Naples before Peard returned to Britain. A very rare photograph. From a 19th century album compiled by Maj.-Gen. Sir Henry Creswicke Rawlinson (1810-1895) and his wife, Louisa Caroline Harcourt Rawlinson (nee Seymour). Sir Henry Rawlinson was a British politician and orientalist, sometimes described as the Father of Assyriology.